Welcome To Smiles Of La Mesa! Comprehensive Dental Treatments for the Whole Family! General, Implants and Invisalign. At Smiles of La Mesa, Your Dental Health, and a Beautiful Smile is Our Top Priority! Choose from a wide variety of dental procedures and services provided by our team of experts. 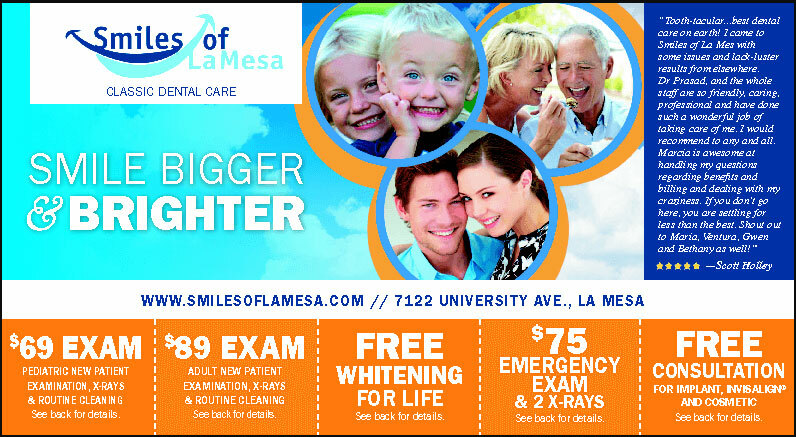 Smiles of La Mesa only provides the very best dentistry has to offer, given with a gentle touch for stunning results! Your dental health and personal comfort are of topmost priority, so you can be assured of something to smile about. We understand that each patient has different needs and concerns, which is why we make sure we provide you dental treatments to specifically match your needs. You will receive valuable post-treatment guidelines to help you make smarter decisions about your oral health needs. Whether your dental needs are a complete exam, cleaning, a full-mouth restoration, or anything in between, our dentists in La Mesa, CA will provide you with exceptional care and provide you with the proper education to help keep the natural beauty of your smile! Every person is different, and at Smiles of La Mesa, we understand that the needs of patients differ from each other so dental treatments are provided to specifically match your needs. Part of our commitment to serving you as our patient includes providing information that helps you make more conscious decisions about your oral health needs. Testimonials from our valuable patients! Always a pleasure coming into facility to nice and friendly faces. I’m always in and out before I know it. Always go the extra mile to make sure my kids and I are okay. Everyone here is awesome! Dr. Prasad does a really good job. Great Dentist! Very knowledgeable and friendly with every visit. Highly recommend them to anyone. Thank you Smiles of La Mesa. You all are awesome!!! My names is Veronica I am very happy to go to smiles of la masa. They are very nice and kind. Every visit is a good visit. I would recommend this dental office. All the people at Smiles of La Mesa are just wonderful and friendly you feel from the first time like you’ve been there before and Dentist are kind and patient and put you at ease. I highly recommend Smiles of La Mesa to all for excellent service. Great staff and dentist, very friendly and good work. My first visit with a dentist in a really really long time. Was a very pleasant experience starting from the front desk to the dentist. Apparently he is new to this area. Overall a very pleasant experience for a dental appointment.